The most used Spanish recipes are not Paella and Gazpacho. It's the mayonnaise, which stars the second song of DiscreetHearts LP. In anticipation, here's a photo gallery conducted by Fabrizio Campisi and Israel Sanchez Beato of the explosive moments from the "Made in Spain: Mayonnaise" videoclip shooting. The Mayonnaise is as yellow as the yellow from the Spainish flag is. It isn't well known in the world that mayonnaise is a Spanish recipe, most of the world thinks it's French. But no, it's Spanish-blooded, native of Mahon, the city of the island of Menorca from which the name of mayonnaise comes from, whose first name was "mahonesa". Beat the egg and start slowly adding olive oil beating well until thick. The more olive oil is added, the more mayonnaise will thicken. Other oils other than virgin olive oil will result other mayonnaises with different flavors and textures, but may be more difficult to mix properly. 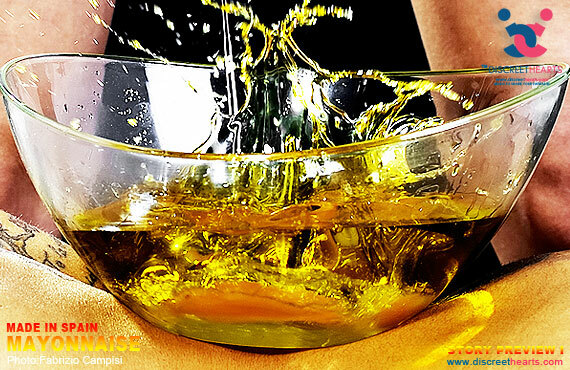 When the mixture of oil and egg has thickened, add drops of lemon juice and the salt and vinegar desired. The mayonnaise is ready when the texture is creamy. What do we get if we mix egg, oil, salt, lemon and vinegar? The Spanish recipe most used worldwide, mayonnaise. Today it is used in a variety of international dishes. Mayonnaise has become so popular in the world because of Its easiness to combine with many different things. With this premise would be easy to answer this question: what is the secret of success? A good base, good ingredients and of course eager to succeed. Mayonnaise is a global success story. Here is the key to success of Discreethearts, good actors, good arguments ... and a lovely audience that shares a few minutes each day in the WEB of DiscreetHearts. Made in Spain: Mayonnaise is the title of Jordi Iniesta's next song recreating something magical and special that will catch you. The photographers Fabrizio Campisi and Israel Sanchez Beato together with the actors of the DiscreetHearts.com series Miguel Angel, Sandra Grima, Safira Claramonte, Santiago Machancoses and Tharna Tirado, that was Miss Valencia 2008, have created the storyboard of the video for this new theme with our artistic director Arturo Laso. These photographies can give you a hint.